The Impact Snoot for Select Impact/Bowens S-Mount Strobes fits over the head and narrows the output into a soft circle that is smaller as you move closer to your subject and grows larger as you move it away. For a still smaller circle of light removable grid is included. The snoot is ideal for creative effects on backgrounds or for a hair or accent light. 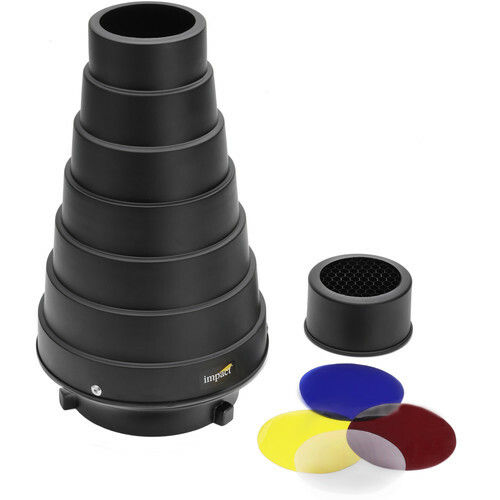 The included filters can be slid into the filter holder for creative color or diffusion effects. The snoot is compatible with Impact Monolights (except EX100A), Bowens, Travelite, Cowboy, Interfit Stellar, JTL, Photoflex, Rime Lite, and Westcott flash heads. Box Dimensions (LxWxH) 9.55 x 5.4 x 5.3"
Snoot for Select Impact/Bowens S-Mount Strobes is rated 4.3 out of 5 by 14. Rated 5 out of 5 by TomF from Well built and useful snoot Hey, snoots aren't high tech, but they are VERY useful when you need a controlled spot of light just where you want it. The included grid doesn't tighten the pattern much, but it does sharpen the shadows. This snoot is well built and fits my Bowens mount monoblocs well; there is no slop. It also handles some of the larger modeling lights well. Rated 5 out of 5 by Larry A. from Works fine, depnding on what you're loo My only gripe is, I thought the light would be smaller in circumference, but that's my fault other than that I am very pleased with it, and have used it successfully in may applications. Rated 5 out of 5 by Kittphoto from Excellent product I received my snoot fast as B&H's service is excellent. It fit perfect on my impact strobe and performed perfectly. Rated 4 out of 5 by Marcus from Works as intended, but need to file for the Aputure 120d. The product itself works as intended, but it was a little annoying that I had to file down all 3 knobs along the rim just so it would fit on my Aputure Light Storm 120d LED Light.? But in the end...it ended up fitting on it just fine! Rated 4 out of 5 by FishyFoto from Finally A Snoot! I have all Profoto lighting, but the snoop is pricey!? I am able to add in one of my Bowen lights with this snoot and it works great. It gets really hot, so don't grab it after using it. It also doesn't fully snap on but works great! Rated 5 out of 5 by Dominic from Would buy again !! Product fits securely on my Impact strobes and offers a very focused beam of light. The colored gels are great for adding some background color and allow for separation of subject. Great product!! Will this fit my Godox SK 300 II studio strobe? As the Godox SK300II Studio Strobe uses the Bowens S-mount connection to connect light modifiers to the monolight strobe unit, yes, the Impact Snoot for Select Impact/Bowens S-Mount Strobes, B&amp;H # IMSIML, would be compatible for use with the Godox SK300II Studio Strobe. Can the gels be used with a 200w Godox LED light? Yes this snoot can work on the Godox 200 watt LED Light. It's compatible with Platinum Pro PT-DPSFK flash kit ??? Unfortunately, B&amp;H is not an authorized Platinum dealer, and we do not carry Platinum items or accessories such as the Platinum Pro PT-DPSFK Flash Kit you list above. I cannot find a website or contact information for the manufacturer. As such, the best I can recommend would be to check with the manufacturer or the dealer of your item and inquire if the light kit you own is compatible with Bowens S-mount light modifier accessories. If so, then it should be compatible with your equipment. Will this fit onto the Interfit Strobies Bowens S-Mount Speedlight Bracket? Does it fit on an Impact Qualite 300 V-2012? I don't think it will. The qualite is an open face light with a circular receptile that allows barn doors to slide in. This is a bowen-s mount. Will this fit on an Einstein with a metal alloy 6 flange adapter? I have found it to fit any bowens type bayonette, with different degrees of tight fit. Does this fit on a Bowens Gemini 500Pro without touching the flash tubes? YES, I am sure it fits, although I do not own the flash. The snout is long enough to give plenty of room inside. Will this mount to the apature lightstorm?